The hopes for Jeoung Youngsik and Lee Sangsu of adding to their the title list remained alive following the semi-final round of the Men’s Doubles event at the Seamaster 2018 ITTF World Tour Lion Japan Open in Kitakyushu on Saturday 9th June. Conversely for their colleagues in the counterpart Women’s Doubles competition any such thoughts were vanquished. It was defeat for Jeon Jihee and Yang Haeun; for the Korea Republic it was mixed fortunes. Winners in 2017 in Magdeburg and runners up earlier this year in Bremen, Jeoung Youngsik and Lee Sangsu extracted revenge. The no.3 seeds, they accounted for Ho Kwan Kit and Wong Chun Ting, the winners two weeks ago on home soil in Hong Kong but more pertinently the pair against whom the Koreans had suffered defeat in the final of the 2016 ITTF World Tour Slovenia Open in Otocec. Success for Jeoung Youngsik and Lee Sangsu, in the opposite half of the draw, it was success for China; neither pair seeded, Liang Jingkun and Zhou You emerged successful in opposition to Chinese Taipei’s Liao Cheng-Ting and Lin Yun-Ju. Impressively they emerged victorious in three straight games (11-5, 11-6, 11-5). 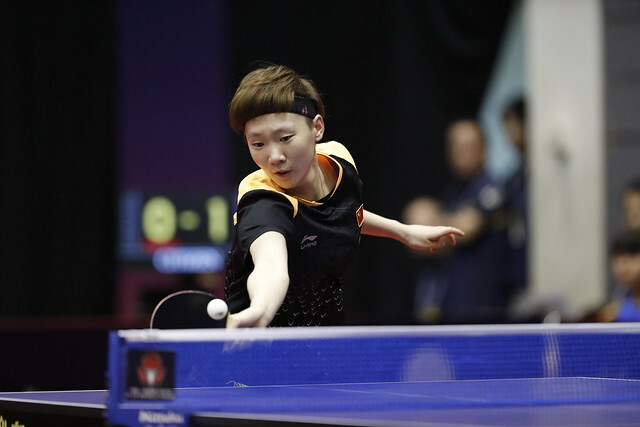 Meanwhile, for Jeon Jihee and Yang Haeun, the no.4 seeds and winners of no less than seven ITTF World Tour Women’s Doubles titles it was defeat. They suffered at the hands of China’s Liu Shiwen and Wang Manyu, the no.6 seeds (11-6, 6-11, 11-7, 11-5). A four games win for Liu Shiwen and Wang Manyu, it was the same for colleagues Gu Yuting and Mu Zi; they accounted for fellow qualifiers Chinese Taipei’s Cheng Hsien-Tu and Liu Hsing-Yin (11-4, 11-4, 6-11, 11-4). Both the Men’s Doubles and Women’s Doubles finals will be played on Sunday 10th June, the closing day of play in Kitakyushu.